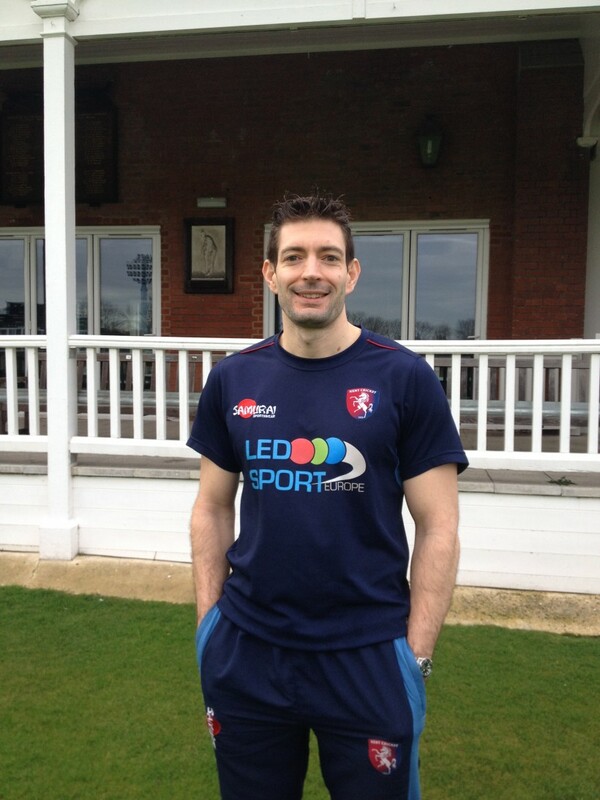 Kent’s new first team physiotherapist Dan George is relishing his new role and finding it an interesting challenge looking after the fitness and medical needs of the players. Dan is part of the new look backroom team put in place this season and he is working very hard to get three injured players Mark Davies, Calum Haggett and Ivan Thomas back to match fitness. Dan looked after the second team last season and has swopped roles with Nimmo Reid who has overall control of Physiotherapy and Medicine and runs the clinic at The Spitfire Ground, St Lawrence. “I am very grateful for the opportunity I have been given to work with the first team squad and I am in daily, sometimes hourly contact with Nimmo and Jon Fortescue, the Head of Sports Science on ways of improving the players fitness levels and monitoring their lifestyles”, said Dan. Looking after the three injured players is certainly a challenge as they recover from difficult injury situations which have not been easy to remedy. All three have not played much, if any competitive cricket this season but Dan is urging everybody to be patient with their recovery. “Mark has a ruptured bicep in his shoulder and an underlying previous problem in the same area and it is a case of improving the strength and stability of the shoulder so that he is confident he can bowl without any discomfort. He has had some setbacks and the next few weeks will be important as to how he responds”. One of Dan’s biggest challenges is all the travelling involved in the intense cricket season and coping with the logistics of taking all their medical equipment to games so they have everything available to cover all eventualities. There are many aspects to keeping players fit and healthy and dealing with their injuries so they can make a successful recovery. The warm-up before matches is important and players need to be aware of their body stresses and mobility and how to deal with them and the sessions need to be fun as well as beneficial. Healthy eating is another important part of a players fitness and Dan and Jonare slowly making changes in this area with weight and diet vital issues. The players are weighed before and after games and fluid intake is monitored so as to avoid the kind of dehydration problems that Brendan Nash had in that epic innings he played against Gloucestershire at Cheltenham last season. “I have found it very challenging but very enjoyable so far”, said Dan “I hope I can contribute to the team having a successful season on the field by keeping them focused and fit and avoid too many injury disruptions”. Dan has worked with the Hockey Club since 2009 and still helps out treating the players during the winter months. He graduated with a degree in Physiotherapy from the University of Brighton and has also been involved with NHS Margate. With his extra workload as a result of being with the first team Dan is grateful to his wife Rachael for her understanding as they have only been married since New Year’s Eve. “Rachel does not see much of me at the moment and she is not greatly interested in cricket but she has been to some games to support the team and myself. We might even make her into a supporter”, he said.